real-time, independently verified advertising metrics and self-serve functionality. Take full control over who can advertise on your website. JARVIS is an invite only system, where you decide which advertiser can buy ad placements with you. 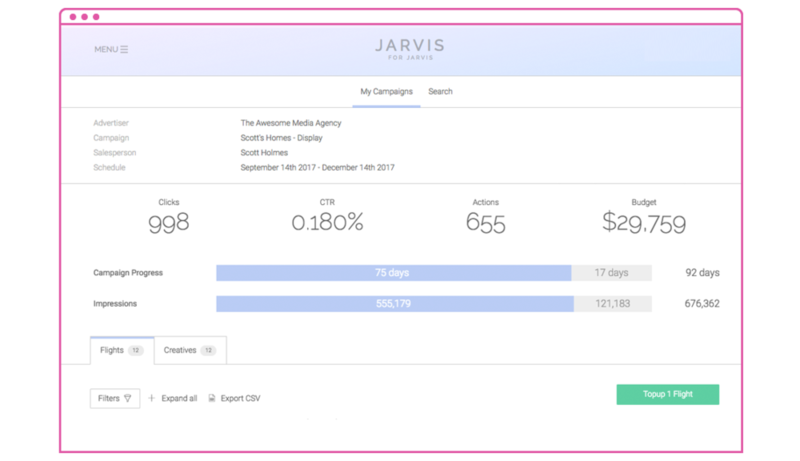 JARVIS ingests Digital campaign data and available impressions in real-time enabling Advertisers to self-serve advertising on a Publishers page with the Top Up functionality. Discover the progression of a campaign as soon as it goes live, from high-level summarised metrics based on location, all this data is being ingested in real-time. Easily spot winning and underperforming creatives in your campaign automatically, with JARVIS's creative preview feature. For each individual creative, discover No. of Clicks, CTR, No. of Actions (leads), Impressions served, eCPC, eCPA and Delivered Cost. It's easy to buy and optimise ads on a Publisher's website with JARVIS' Top Up feature. Clients can self-buy available impressions on each campaign and we'll start serving ads on your page automatically. You're in control. Never miss an opportunity to buy your audience!